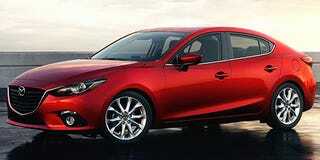 What Do You Want To Know About The Mazda3? We’ve got a rental, and it’s one of these. Any questions? Plot twist: We’re in Montreal, so it’s Canadian spec. My wife and I needed the second car since I’ll be returning to the US before her, and my BRZ’s stiff (yet stock) suspension is beating us up badly on Montreal’s roads that were returned to Earth from the cratered surface of the moon.